Above: Opera Series, by Paulo Catrica (Portugal). This is a very quiet picture. It is of a workbench at the opera house, now used to store material, which was once used for productions. A faded flag, a wooden sword without a hilt, string; things which might come in useful at some point, but are now not needed. What immediately strikes me about this image is the subtlety of the tone and the simplicity of the framing. 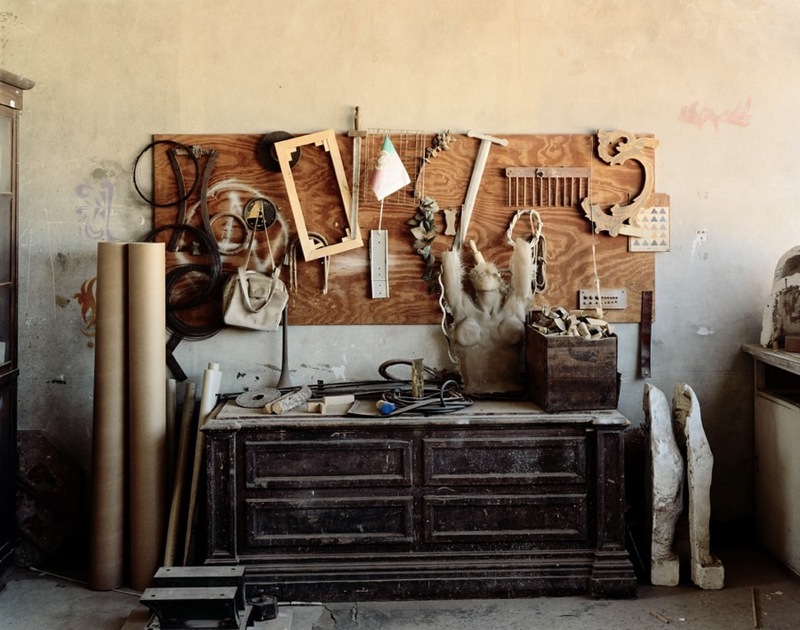 I am reminded of Morandi in the balance of the tone, the emphasis on the ordinary, and the flatness of the light. For me, this image connects the world of craft to that of opera and music. Above: Carnival Roztoc Masopusty, by Marketa Luskacova (Czech Republic). I find this image striking because of the composition and the tension between the static and the dynamic. The image is anchored by the boy with his crude mask, his coat shaped by the wind. There is a stillness to the Groucho Marx figure with his Stetson and his white training shoes, unsteady on the precipice; but the drama is created by the swirl of the witch’s cape, the bounding decent of the dog, and the distorted alien shaped shadows on the ground. The movement of the picture is balanced by the figure of the woman in the distance clambering into it with uncertainty. What is remarkable about this image is how it depends on the accuracy of timing and how the artist has transformed an interesting scene into a thing of wonder by getting her timing just right. Apart from the photographic qualities of this image, I chose this image because it represents what was a Europe-wide tradition of carnival: a period of celebration before Lent which has pagan origins and in which the forbidden is tolerated. Above: Flower Jar (1987-1995), from the series Minne.Muisto.Memory, by Nina Korhonen (Finland). This is an unconventional portrait, because the viewer sees more of the object of the child’s gaze than of the child’s face. The prominence of the jar and the strangeness of its contents keep drawing the eye away from the child, but in doing so, child and viewer share the same object of attention. 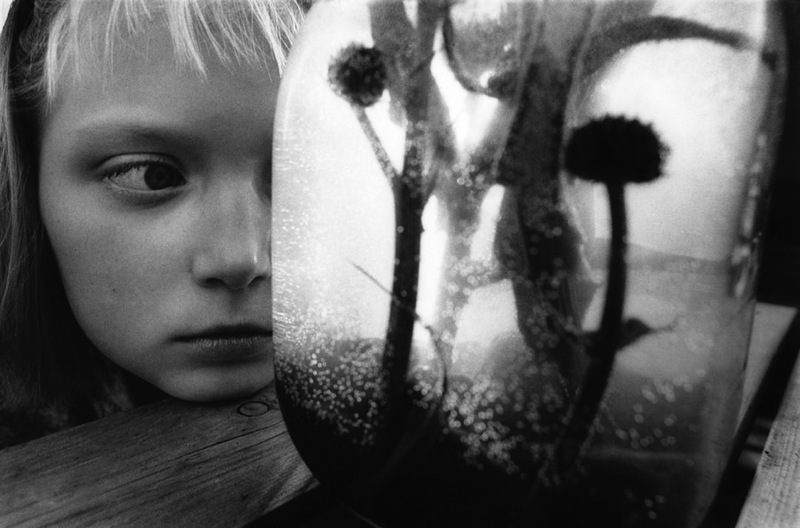 For me, this image is strangely apocalyptic: the plants in the jar look like alien life forms from a science fiction movie, the child transfixed but clearly uneasy about the contents. This photograph does what all good images do: holds your attention and makes you wonder. Above: Actors, by Adam Panczuk (Poland). This is a portrait of a troupe of actor farmers. 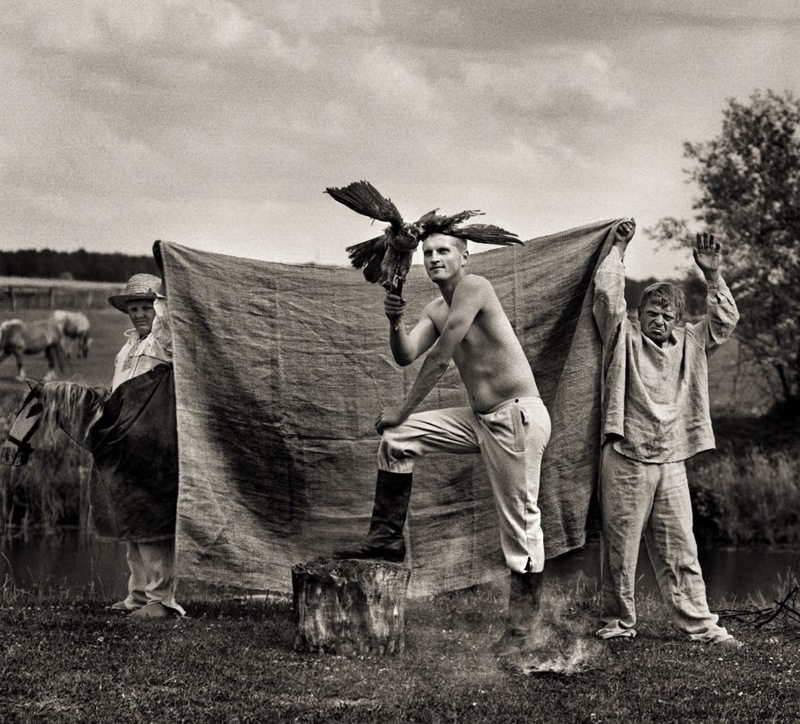 The image is made by the backcloth, which both suggests theatrical performance and separates that activity from the paddock and fields in the background — the usual workplace of the actors. The figure on the left conveys the rudimentary nature of the theatrical props, whilst real horses in the background mock the crudeness of the toy horse being ridden. The suspicion of the two backdrop bearers contrasts with the central figure in his riding boots and with a hawk, whose dress and confidence suggest an elevated social and economic position. This is a simple composition which reminds me of the work of August Sander. The viewer is transported to a time which cannot be located with exactness. For me, this picture illustrates the human need to tell stories, to be transported to an imaginative world away from our ordinary lives, but also of labour and the tremendous importance of agriculture. 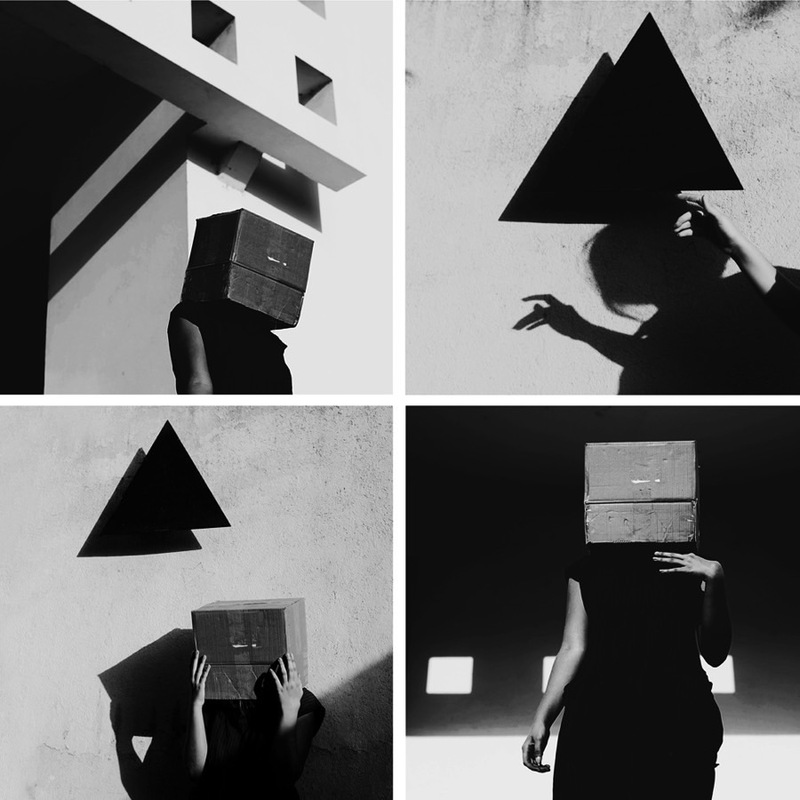 Above: How to think inside the box, by Oana Stoian (Romania). I am not a great admirer of conceptual photography because I feel that the images are usually too weak to support the concept. But I chose Stoian’s image because of its playfulness, and the way in which light and shape are used to create a dramatic panel of images. The title is also useful reminder of the straitjacket of culture and tradition, and of women’s limited rights to fully participate in cultural life. Above: Fragments of Remembrance, by Astrid Kruse Jensen (Demark). 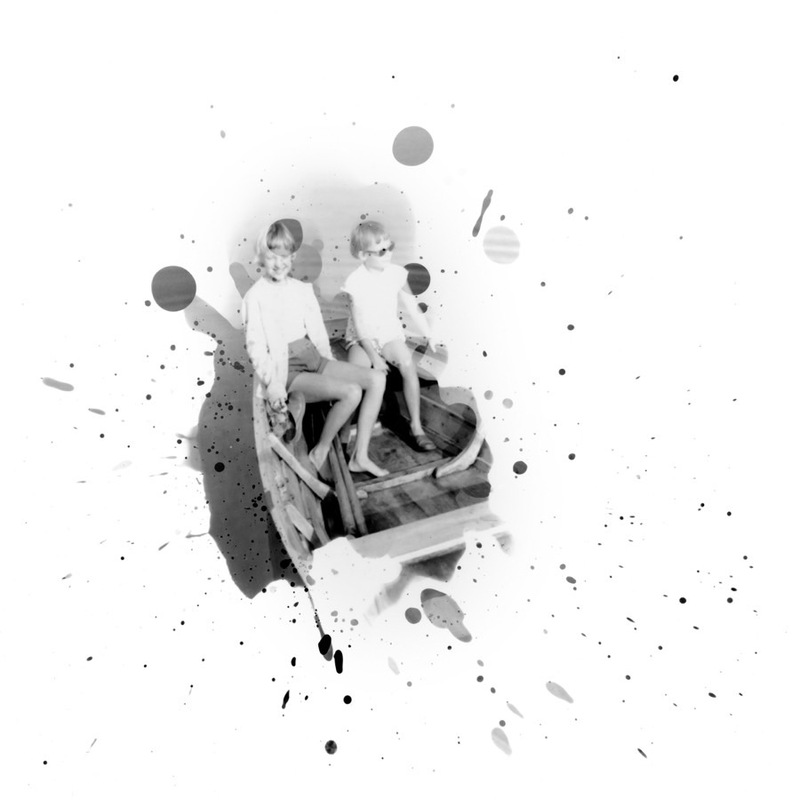 Whilst there are clearly analog images here, I was keen to have an image which made reference to photography’s roots in the chemical process. It alludes to the particular part which photography played in everyday life, before the advent of the digital camera or mobile phone: something which happened rarely and was usually used to record a significant event. Jensen’s image also reminds me of the hit-and-miss nature of photography, and the part which chance plays in the creation of good images. It is about remembrance, one of the ways in which cultural heritage is transmitted. 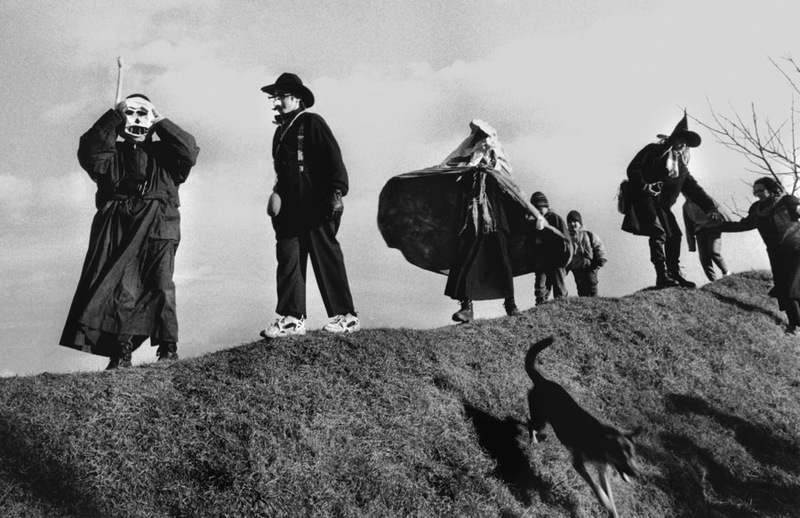 Above: Lithuanian Pilgrimages, Varsedziai 1976, by Romualdas Požerskis (Lithuania). This is a photograph of pilgrims halting en route to worship at a shrine. 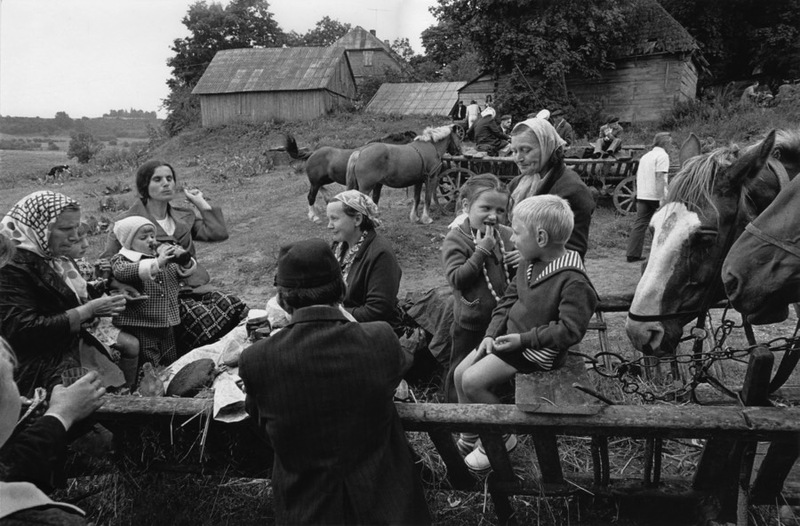 It is a photograph at ease: women and children are chatting and eating; the horses have been unhitched and they too are eating. This picture is built of layers, leading up to the farm building, which would not look out of place in a Breughel. Whilst it is contemporary, it is an occurrence which has taken place over hundreds of years. What I particularly enjoy about this picture is the conviviality and the calm it conveys of a day out. Religious belief and the institution of the church is and has been one of the mainstays of cultural heritage in Europe. Above: Warriorettes, by Gerry Balfe Smyth (Ireland). 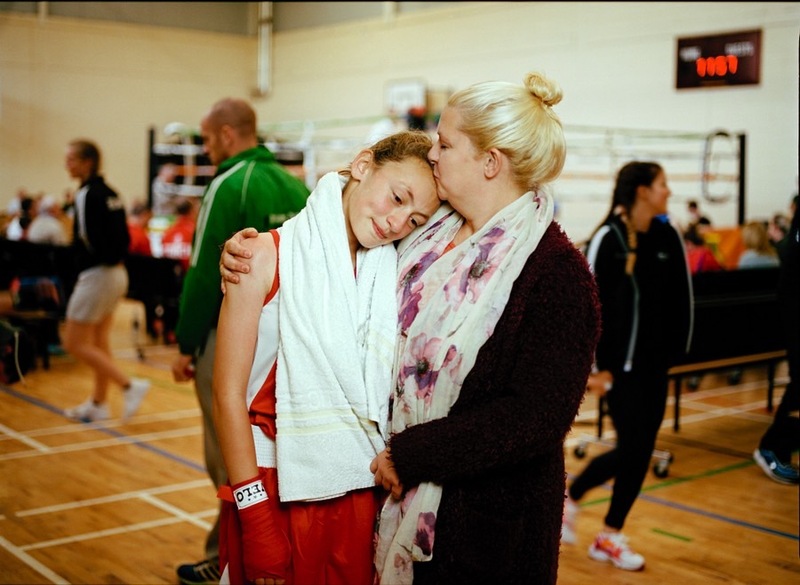 I like this image because of the tenderness it portrays, and of how this is at odds with the brutality of the sport in which the girl has just participated. It also portrays the breaking down of barriers. The social change which this image makes reference to contrasts with the continuity of the bond between parent and child; the foundation of all social relations and without which culture could not be transmitted. 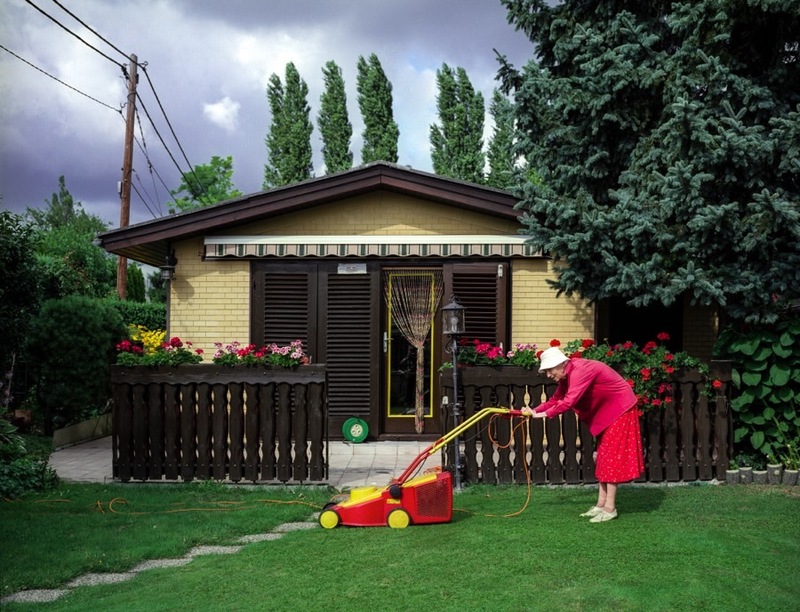 Above: Middle Class Utopia, by Klaus Pichler (Austria). This is an image striking for its composition. Everything in the frame combines to form a satisfying outcome and even manages to be quite funny: the old lady is burdened by ownership and of the need to maintain the perfection of her house and its garden. Her dress suggests a stroll to the shops rather than the arduous task of mowing. I also enjoy the way in which the primary colours of the lower part of the picture giveaway to the mid tones of the upper section. I chose this as a representation of conformity, and its burden, but also because cultural heritage is premised on control over the environment. Above: Jeff Koons, Ushering in Banality, by Henk Wildschut (The Netherlands). Henk Wildschut’s work is normally associated with serious topics. Whilst this image is part of a serious project, I wanted to introduce humour, and for me this picture combines the serious with the absurd. The figure in the centre, tongue protruding through teeth, shows the care with which the sculpture is being edged towards the place it is to occupy on the plinth. The human figures pushing the sculpture echo the actions of the figurines. The neutral colours in which the crew are dressed, and the whiteness of the walls and plinth underline the absurdity of the sculpture with its unshaded pastel colours. This picture was chosen to refer to high art and the tension which always exits between it and popular culture.